If you haven’t experienced the conversation stemming from Which One Doesn’t Belong? activities, you are missing out. As far as I can decipher (#MTBoS feel free to correct me), this all began with Christopher Danielson’s Shape Book centered around this structure. From there, a crew of tweeps (headed up by Mary Bourassa) established WODB.ca (YES! Canadian) to curate a collection of problems of this format. 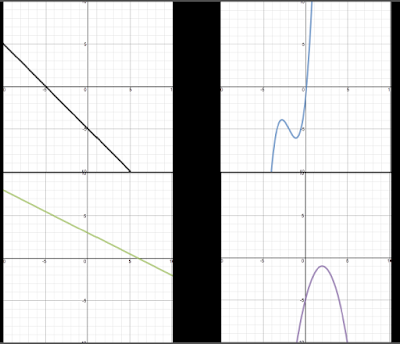 My unit on polynomial functions (either in Foundations of Mathematics 30 or Pre-calculus 30) requires students to decipher attributes of polynomial functions from their graph and vice versa. These include end behaviour, sign of the leading coefficient, y-intercept, domain, range, degree, and possible number of x-intercepts. Each question has four panels. Each panel needs to have an attribute that is unique. (i.e. that could be the reason that it doesn’t belong). I sat down to build some polynomial WODB questions, and had a hard time isolating unique attributes with sets of four. I ended up with three examples like the one below. If you open up space for rich conversation and critique, these three could last upwards of 30 minutes. (One student insisted that colour was always the answer, which, in hindsight, was my bad). After we were done, I should have had students try and create their own. That activity would show a deep understanding of the parameters. Alas, I succomed to the age old barrier of time. Download the .pdf with all three questions. Steal, modify, and adapt. If you make more, link in the comments.